The adjacent beaches to Gröte are superb (see post 17 October). 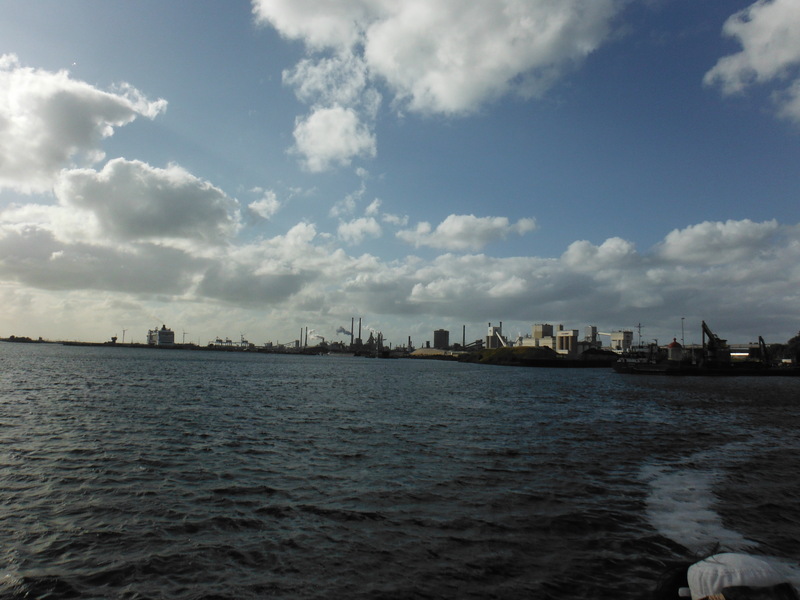 Journeying south takes one through some delightful and quiet forested areas (below right). By this time cyclists travelling south are following one of the country’s long-distance cycle routes, in this case, LF1A. This makes navigation easier as the network of paths and small roads is extensive and potentially confusing. Bergen marks a southerly marker for this park area. 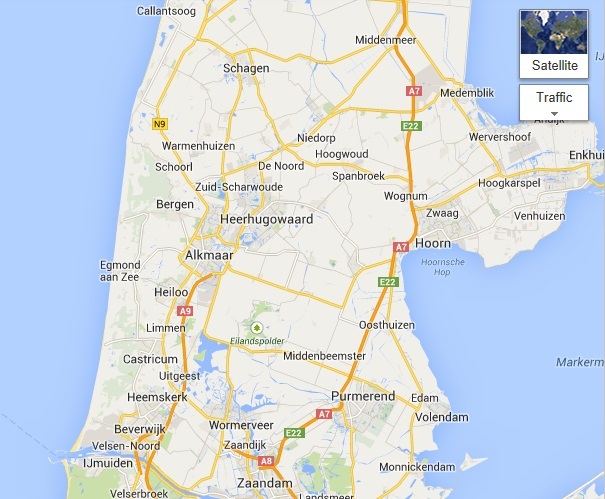 Onward takes one through small indistinguishable towns such as Egmond aan den Hoef and Castricum. Parallel, one could negotiate Alkmaar and Uitgeest (further West). We stayed with the LF1A long distance route through Wijk aan Zee primarily because of our desire to make camp at Zandvoort, a resort 20 km south from IJmuiden. Arrival at IJmuiden on the LF1A demands a decision. There is a significant stretch of water to cross either by small bridges across locks (downstream – see map below) or a ferry (upstream). We opted for the ferry. The ride to the ferry seemed like a huge detour. We had to wait with the locals about 15 minutes for the ferry. Operated by Arriva – a company that seems to have all public transport contracts in the area: ferries, buses and trains – is at least free. 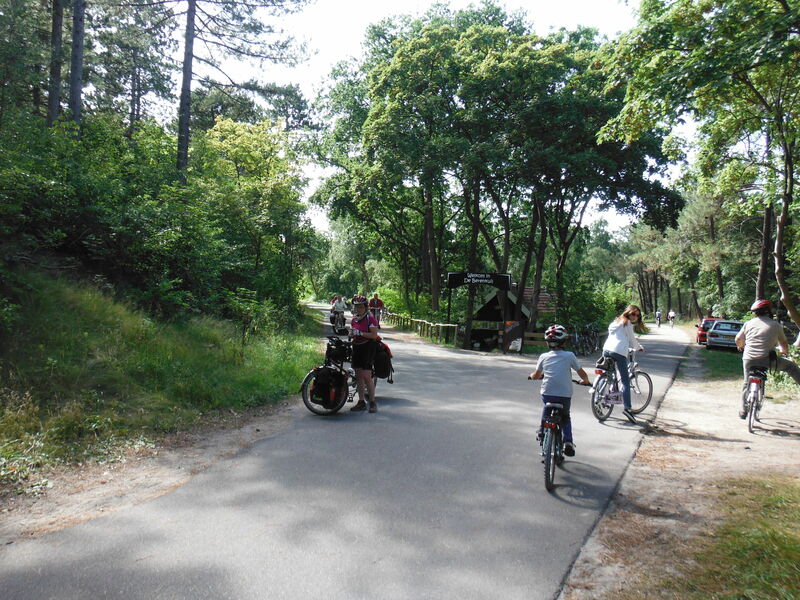 Once across, the path goes through another national park, the Zuid Kennemerland National Park. It is gated, so being there late in the day is not a good idea. But it provides a pleasant and safe approach to Zandvoort. 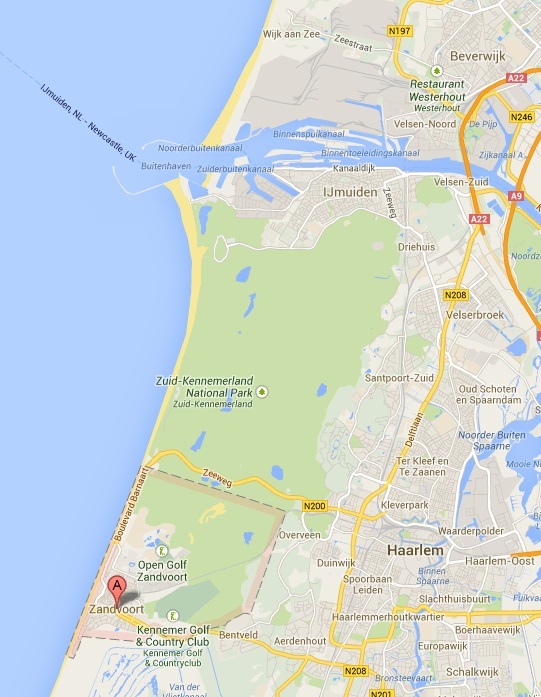 Zandvoort is a reasonably large – but unattractive – resort. Summer weekends are busy. Very busy. Accommodation is not easy to find. We had planned to camp at Camping De Branding on the north side of the town. On inspection, we decided not to. It would have been very difficult to squeeze in and the loud party music had already started. Instead we rode back out of the town and checked in at the Kennemerduincampings (on the N200 just before it turns due south into the town). Essentially camping in the dunes. It is huge. Reception to day tent area was a 15 minute ride! And, ideally, one needs some extra long tent pegs as the dunes are soft. Pitching can be a challenge. There was a restaurant, fortunately, as we were far to late to get into town.